Sometimes a grandmother can change your life. A few years ago, Brittany Bennett wanted to prepare an apple pie for Thanksgiving dessert. With no shortening on hand to make a crust, she was headed for the door and the store. Her grandmother told her to just wait. She had a family recipe, a Dutch family recipe, that does not require shortening. Or even a rolling pin. 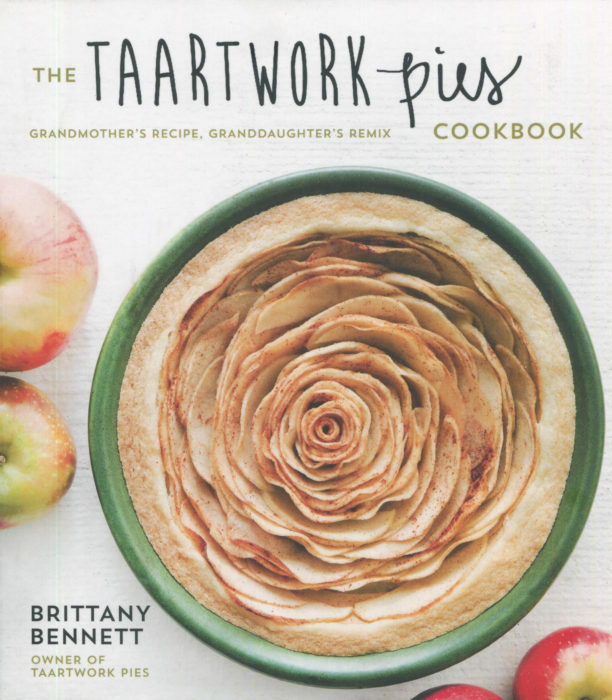 That apple idea, and the special way of forming a crust with your hands alone, one little ball at a time, is the genesis of The Taartwork Pies cookbook by Brittany. The book is filled with recipes, from her grandmother and from The Netherlands. While American cuisine has been widely influenced by France and Italy, most of us would be a bit challenged to find The Netherlands on a map. It’s there, snuggled between Belgium and Germany. You probably don’t have a neighborhood Dutch restaurant near you. These ideas come from the chapter devoted to summer. Tarts, or taarts, or pies are a year-round delight, so you’ll find chapters for Spring, Fall, and Winter, too. With Fall approaching, you might be interested in the Brown Sugar Pear and Rosemary Goat Cheese Tart. As you can begin to see, this is far, far from an ordinary pie book. It’s a lovely collection of richly composed ideas. The book is carefully packaged with lovely photos of many [oh, but not all!] the pies. The ingredient lists are moderately long, with a dozen components for the pie itself and then more for a topping or crumble or other adornment. The instructions are done in 6-10 short paragraphs. The writing is easy to understand, and very easy to follow. The big reason to enjoy this book is the crust, her grandmother’s crust. You don’t roll the dough out. You make a big ball of dough with your hands, break off small pieces, and one-by-one shape those into your completed crust in the bottom of your pie plate. Yes, I know, you are thinking “Play Dough.” No, I haven’t done it yet. But I’m about to. And I’ll blog the results once I clean off my hands. I’m charmed by the dough concept and salivating over the pie ideas. First up? That Lemon Zest Dark Berry Pie. I’ll let you know. And, in the meantime, you probably want to get started on your own. Get your fingers covered in dough, and let your tummy enjoy Dutch delights.